A dynamic four-piece of fiddle, flute, guitar and percussion, Gnoss tackle energetic tune sets and driving folk song with a ‘maturity of ability many of a greater age will envy’ (The Living Tradition). As current and former students at the Royal Conservatoire of Scotland, Graham Rorie, Aidan Moodie, Connor Sinclair and Craig Baxter have been tipped as ‘ones to watch’ by Songlines magazine for their lively, engaging and honest performances. Forming as a duo in 2015, Graham and Aidan picked up a prestigious Danny Kyle Award at Celtic Connections and reached the semi-finals of the BBC Radio 2 Young Folk Award 2016. Since expanding to a four-piece, Gnoss have continued to delight at performances and festivals across the UK and Europe, earning a nomination for Up and Coming Artist of the Year at the MG Alba Scots Trad Music Awards 2017. 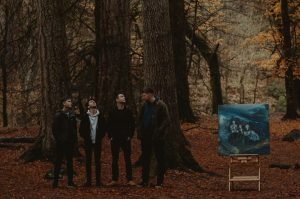 They bring their show to Comrie as part of their tour to launch their Debut Album, Drawn From Deep Water, released on April 27th.